The lightweighting of automobiles is well underway and that trend will continue throughout the next decade at the very least. Aiming to reduce fuel emissions and meet GHG requirements, automobile manufacturers need to significantly reduce the weight of vehicles, and they have several tools at their disposal. The gradual but increasing use of aluminium alloys is the first and main solution to make vehicles lighter. The second alternative is utilising advanced high strength steels (AHSS). These two metals will most likely lead the lightweighting game in foreseeable future. However, despite improvements, steel still cannot compete with aluminium when it comes to vehicle lightweighting, especially in heavy passenger vehicles: SUV-s and light trucks. Vehicle lightweighting done by the intensive use of magnesium, composite materials – carbon fiber reinforced plastics (CFRP), glass fiber, and some other materials – will be limited to luxury cars due to high costs. To be acceptable, lightweight solutions need to be incorporated into the vehi­cle design without compromising quality, comfort, safety or competitiveness. In general, the use of aluminium and other light materials will be predominant in heavy vehicles, like pick-ups and SUVs, while AHSS will most likely remain dominant in light and small vehicles (such as the VW Golf 7 for instance, resulting in the structural weight reduction of ~ 100 kg, or 220 lbs). Tensile strength, ductility, and cost considerations lead a vehicle’s body and exterior to rely heavily on AHSS and aluminium alloys – now and in the future – while semi-structural interior and powertrain components have a different set of needs, creating more opportunities for magnesium and composites. 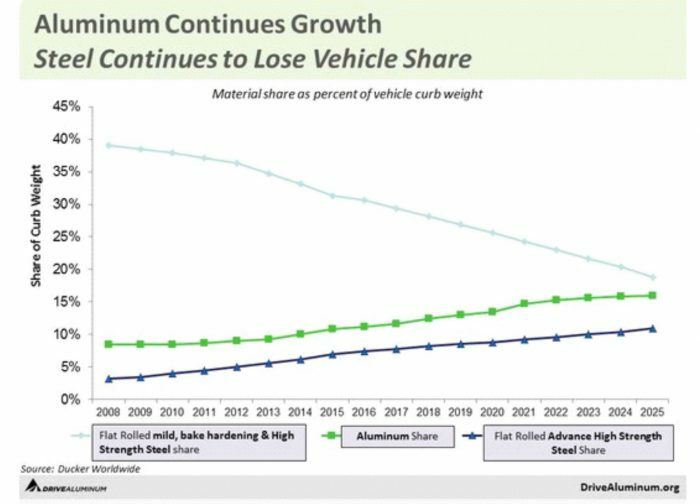 Aluminium’s share of the average automotive materials mix in the world is likely to reach 15-16 % by 2025, up from approximately 9% in 2015, while the average aluminium content in cars in Europe and North America is expected to increase to 19-20% of the car’s curb weight, up from 10-11% in 2015. There are several key advantages and disadvantages of aluminium vs. steel in automotive applications that influence decisions of their future use. Satisfactory high tensile strength, corrosion resistance, and recyclability of aluminium alloys are among key factors contributing to accelerated growth of aluminium applications in automobiles. Large aluminium content increases for body parts, closures and larger transmission cases will more than offset small content losses for components in smaller engines and stiff competition from new AHS steels for suspension control arms in future vehicles. With the exception of a few critical areas, such as roofrail, longitudinal front and upper, aimed to improve critical points and safety of passenger cabin, it is now possible to make an entire body-in-white (vehicle structure) from aluminium, resulting in significant weight reduction and performance increases. 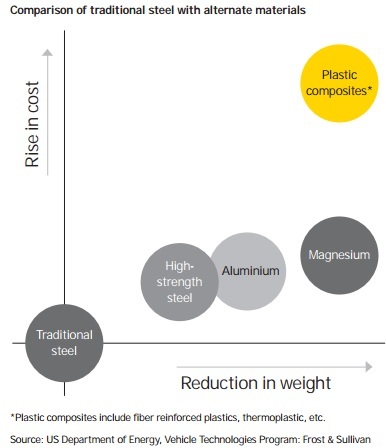 According to research by University of Aachen and the European Aluminium Association, used by the automotive industry when deciding on future material use, strength is not a limiting factor for conversion from steel to aluminium of most components. As for weight reduction potential (BiW and closures), AHSS has 11 % (YS up to 1200 MPa), while aluminium alloys series 5 and 6 have up to 40% (YS up to 400 MPa). Aluminium alloys series 7 (7075,7049) have an even higher yield strength, close to 600 MPa, but for now applications are mostly limited to the aerospace industry due to higher costs. Due to their lower density, aluminium components in cars are thicker compared to the AHSS components for the same purpose. At 2,700 kg/m3, the density of aluminium is ~ one third of that of steel. But such a weight reduction is seldom reached since, for a large number of parts, it is necessary to increase the average thickness of aluminium compared to steel to achieve the same part characteristics. The most frequently encountered ratio of thickness in structural applications is approx. 1.5 (Al vs. AHSS) which means, for instance, that a 0.8 mm steel component can be replaced by a 1.2 mm aluminium component. In this case, the weight reduction is still ~ 50%. The combination of strength with ductility is the key performance parameter desired for automotive applications. However, the relationship between the material properties and the strength, stiffness and weight of a component is very complex and can be strongly influenced by the geometry of the part, meaning that there is no absolute rule. There are limits to what can be achieved – traditionally, higher tensile strengths come at the expense of ductility. While there are ways to improve strength, such as hot stamping, or additional heat treatment cycles, the technology required can have significant effects on both cost and production cycle time. One of the arguments that steel producers use to defend their dominance in the automobile industry is to claim that some 190 million tonnes of steel products per year are used in the production of automobiles worldwide, compared to some 11 million tonnes of aluminium products (2015 data). Similarly, they point out that aluminium accounts for only about 9 % of the weight of a typical car versus some 53 % for steel. The aluminium sector has hit back by saying there is a limit to how much steel can be strengthened and made thinner. A car made out of a high content of aluminium instead of steel will generate a larger impact on the environment (energy consumption and GHG emissions) during its raw material and production phases, but a much lower impact during its product-use phase, and most important of all, a lower impact in its whole LCA (Life Cycle Assessment). On this basis it can be stated that as far as LCA indicates, aluminium should continue to replace steel. Possible aluminium price increases in the future represent the main risk for the growing use of aluminium in the automotive industry. 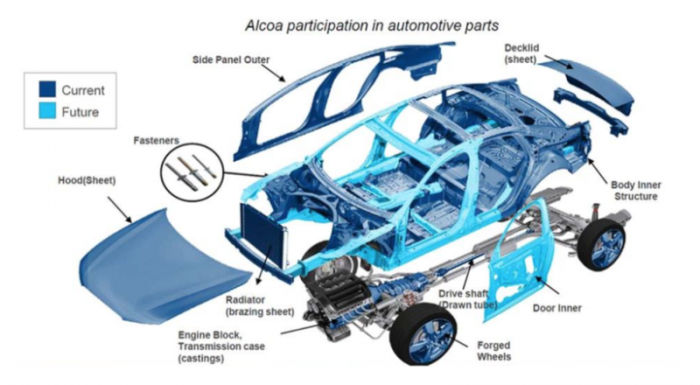 The eventual commercial use of the third generation of steel, already produced and delivered to some OEM-s and car producers, will only insignificantly influence aluminium use but may well replace the previous generation of AHSS from vehicles. And the third major risk for both aluminium and steel in vehicles may come with the appearance of super power batteries and more intensive use of hybrid vehicles, though even in that case the vehicle lightness would be preferable albeit not obligatory. The third generation of AHSS, having microstructures on the scale of nanometres (‘’Nano Steel’’), is smaller than those found in traditional steels. It provides the high strength required by automotive engineers as well as significant ductility – “the strongest available steels with the formability of mild steel”. In short, the higher a material’s formability, the more an OEM (Original Equipment Manufacturer) can optimise a part’s geometry, and thus the thinner the sheet needed. An AHSS that does not sacrifice on strength but provides high ductility would give manufacturers the chance to reduce weight, whilst maintaining stiffness. 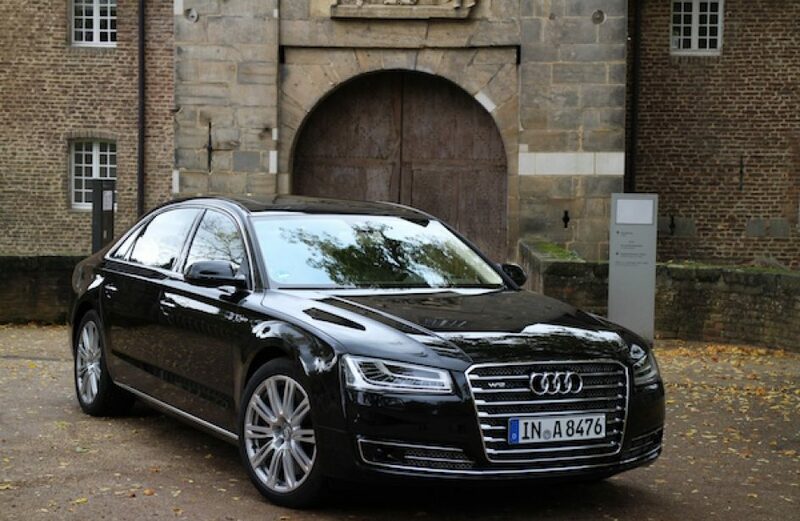 What’s most important for the future of aluminium use in automobiles is the current indication of good performance in existing models, before all the Ford F 150 (as the best selling vehicle in USA), but also other brands, such as the aluminium intensive Jaguar Land Rover models and the Audi A8. So far, results have been excellent – every aluminium intensive car and truck crash tested in the US has earned the highest 5-star safety rating. Consumers are satisfied, not just in terms of fuel economy, but with overall performance, durability and safety. 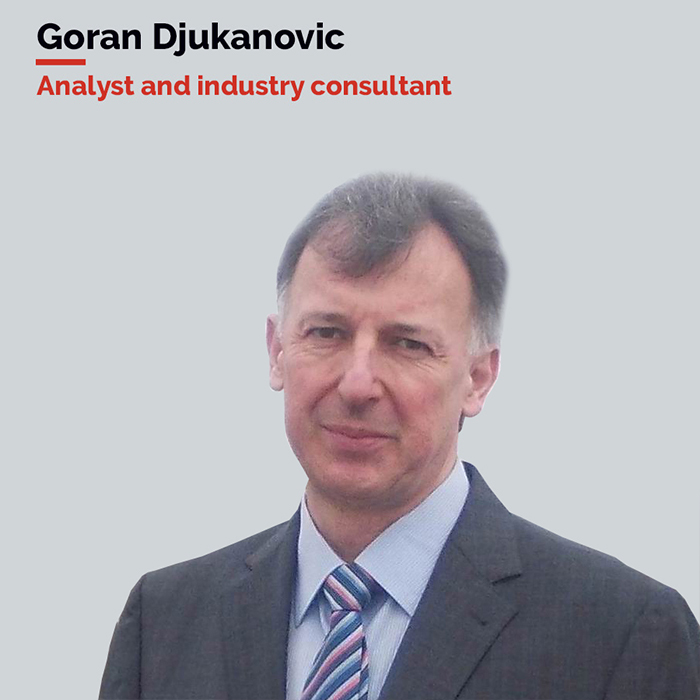 The key task of automobile manufacturers is to persuade buyers that they are buying secure and more technically advanced vehicles compared to previous models. And this has to be proven in practice. AHSS cannot successfully compete with aluminium alloys in the automotive industry for weight reduction purposes, especially in bigger vehicles (SUV’s, trucks etc). With the eventual successful implementation of ‘’Nano Steels’’ by the steel industry in the near future, the aluminium industry may then respond with the higher use of 7075 and 7049 alloys, which are able to compete in properties (specific tensile strength and ductility) with AHSS. All in all, the aluminium vs. steel battle continues.